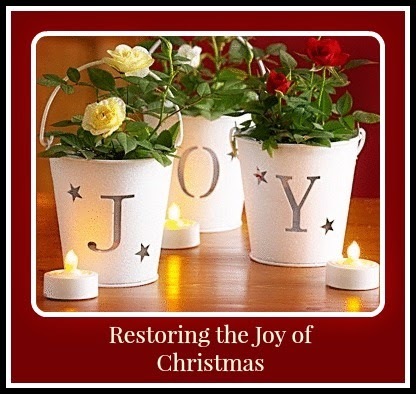 "Restoring the Joy of Christmas"
I love Christmas and I get more child-like excited as the season approaches! In truth, I think I love the days leading up to Christmas more than Christmas Day itself. Although when I was a child, it was December 24th -- Christmas Eve -- that was my most treasured day of the year. For that was when our little family celebrated Christmas, except the turkey dinner, which was reserved for December 25th. But I do realize that sometimes it's harder to get in the Christmas spirit, especially when Life seems to load us down with problems and circumstances that hardly bear thinking about. And if the demands on our time, energy, and pocketbooks are already heavy, at this time of year with all its expectations, it weighs even heavier. As my dear mom would say when one more thing would pile up, "It's enough to take the joy right out of living!" So... if your life is feeling as heavy as a fruitcake and your joy seems as far flung as the star of Bethlehem, I invite you to stop by here during the month. It'll be a little like opening a new window every morning on an advent calendar. And of course, it's my hope that when you 'open' that window you'll find something that puts a lightness in your step, a twinkle in your eye, or a little smile on your lips. and every window open to great possibility."